We all fantasise about the “better” lives we could lead if we just won the lottery, imaging financial freedom, exotic adventures and ultimately, lifelong happiness. For an alarming number of lottery winners, however, this is not the case. A combination of overzealousness, excitement and poor money management has resulted in many lottery winners going completely bankrupt, leaving them in a much worse position than before they struck gold. We take a look at some of the unfortunate lottery winners who lost it all. 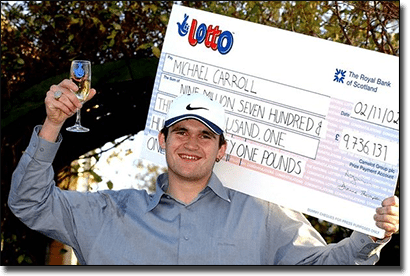 Michael Carroll, was 19 and working as a garbage collector when he won a 9.7 million pound jackpot in a British lottery in 2002. At this point he already had a criminal record and was being monitored by a police ordered electronic anklet, which could have provided a sign of things to come. Michael Carroll spent his money with all the reckless abandonment that could be expected of a 19 year old petty criminal, blowing millions on mansions, luxury cars, parties, gaudy jewelry, drugs and prostitutes. Within five years he was back to where he started from, bankrupt, collecting unemployment cheques and living with his mother. Today he works in an assembly line at a cookie factory, reportedly earning around $300 per week. In 1988, American man Bud Post thought he had it all when he won the Pennsylvania state lottery, taking home a jackpot of $16.2 million. In a catastrophic tale of good times gone bad, within a couple of years Bud had not only lost it all, but was a million dollars in debt. Bud initially blew a huge portion of his money on real estate and luxury items like a twin engine plane, despite not having his pilot license, but then the trouble really started. An ex-girlfriend sued him for what she believed was her rightful third of the money, his brother attempted to hire a hit man to murder him in hopes of claiming the inheritance and Bud was arrested on an assault charge after firing a gun at a debt collector. By the time he passed away in 2006, Bud was reportedly barely surviving of a $450 a month disability pension. When Callie Rogers won 1.9 million pounds in the UK lottery in 2003, she became the youngest ever person to win the lottery in the United Kingdom. Her youth and naiveté did her no favours and within only a few years she had lost a majority of her fortune to plastic surgery, drugs and partying. By 2011, Callie reported that she had undergone two breast implant surgeries and has spent over $350,000 of her winnings on cocaine, a reckless lifestyle that had led her to four suicide attempts. She now lives a quiet life in a modest house with her three kids and is studying to become a nurse. In 2004, Sharon Tirabassi was a single mother struggling on government welfare cheques whose life changed dramatically when she won over $10 million Canadian in an Ontario lottery. To celebrate no longer having to live hand-to-mouth, Tirabassi blew her money marvellously on all kinds of unnecessary luxury items that included property, designer clothes, extravagant parties, wild vacations and expensive cars (most notably, a $200,000 customised Cadillac Escalade). Today, she lives in a rented house, takes public transport and works part time, but was smart enough to put some of the money in trust accounts for her children before she lost it all. David Lee Edwards was a convicted felon from Kentucky who had spent many years in jail after robbing a petrol station. In 2001 he thought his luck had changed when he won a huge $27 million Powerball jackpot. Rather than using this fortune to turn his life around, David Lee Edwards spent his millions on opulent mansions, lavish cars (so many that neighbours complained that his driveway looked like a car dealership), private LearJet complete with his own personal pilot and most of all, drugs. A bad crack cocaine addiction contributed hugely to his financial losses and by 2006 David was back to square one. He died penniless and alone in 2013 and was cremated, leaving his family without the money to give him a proper burial. The real lesson to be learnt here is that no matter how much money you have, it will always come and go. Just because you’ve suddenly become a multi-millionaire, it doesn’t mean that you’ve instantly bought your ticket to eternal financial security. Be mindful that while a million dollar win may seem like a fortune, it barely covers the cost of a four bedroom house in an opulent Australian neighbourhood these days. If you’re lucky enough to win big in the lottery, think smart. Hire yourself a good financial advisor, make some wise investments and try and keep a modest head on your shoulders.